Here's a conundrum for you-I don't like sausage. But I like sausage gravy and biscuits. It's weird but...eh...whatever. 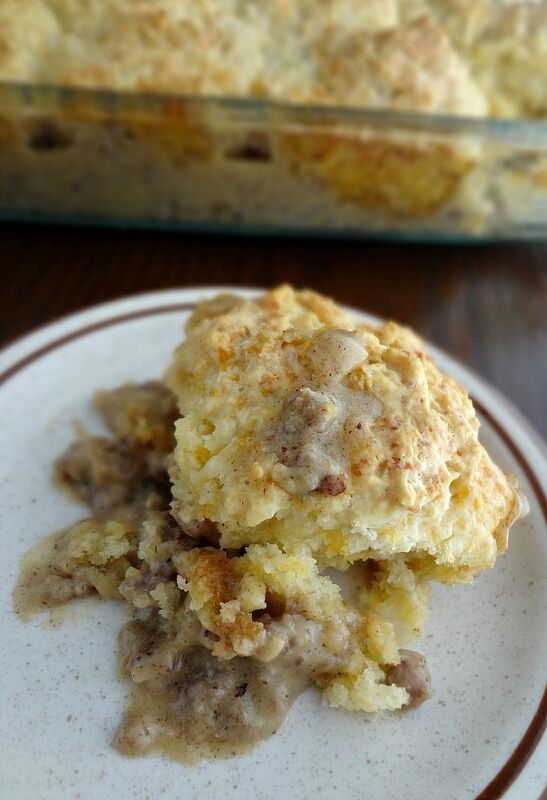 Anyway, me finding out that I like sausage gravy is a fairly recent event and so when I saw a recipe for sausage gravy & biscuit casserole...I was like-yeah. I've got to make that. And so I did. And...I had to heavily adapt the recipe because I do not know what was up with the milk measurements but they were definitely off. I also decided to make the biscuits drop biscuits to save all of us a little time and effort. And now I have thoroughly tested this for you and can pretty much guarantee that it will be perfect and you will love it! Obviously...this is total comfort food. It's rich and flavorful and makes you feel good. The biscuits have some cheese in them because-I mean...yum. 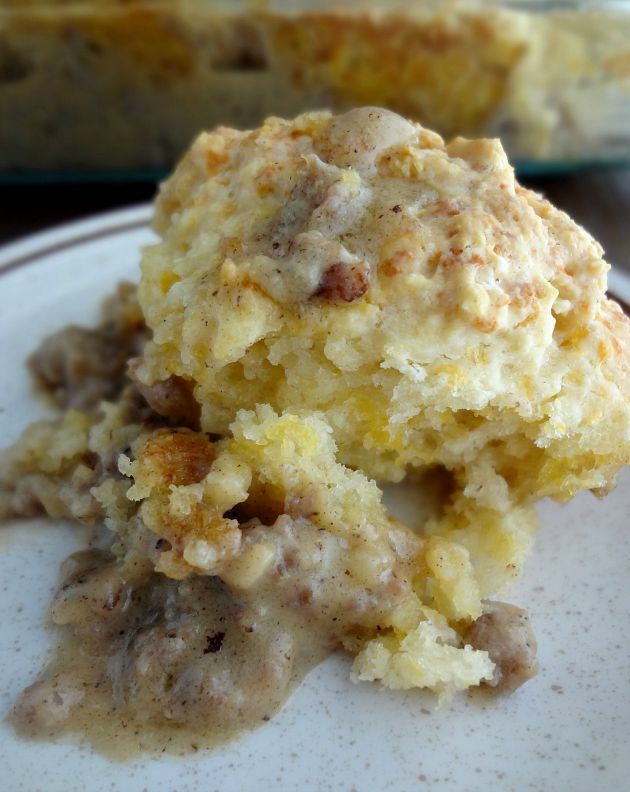 They bake in the delicious sausage gravy, soaking up a lot of that flavor. And you then have this fantastic-ness. Which I knew that I loved and I figured Michael would tolerate. Umm...he came home. He tried it. He went "Mmmmmmm! Oh my God...this is really freaking good." YES...yes it is! Cook sausage in a large, somewhat deep, skillet until browned and cooked through, set aside. Melt the butter in the skillet over medium heat and then whisk in the flour--try your best to scrape up any bits that have stuck to the pan from the sausage. Add milk and chicken bouillon. Stir until combined and thickened. Turn off heat. Crumble the cooked and somewhat cooled sausage into the gravy. Add salt and pepper to taste. Spray a 9"x13" baking dish with nonstick cooking spray. Pour in the sausage gravy. In a large bowl whisk together flour, baking soda, baking powder, and salt. Cut in chilled butter using a pastry cutter or your fingers--until the mixture resembles coarse crumbs. Slowly add in buttermilk until the dough forms a ball-you'll want it to be a bit wet but firm. 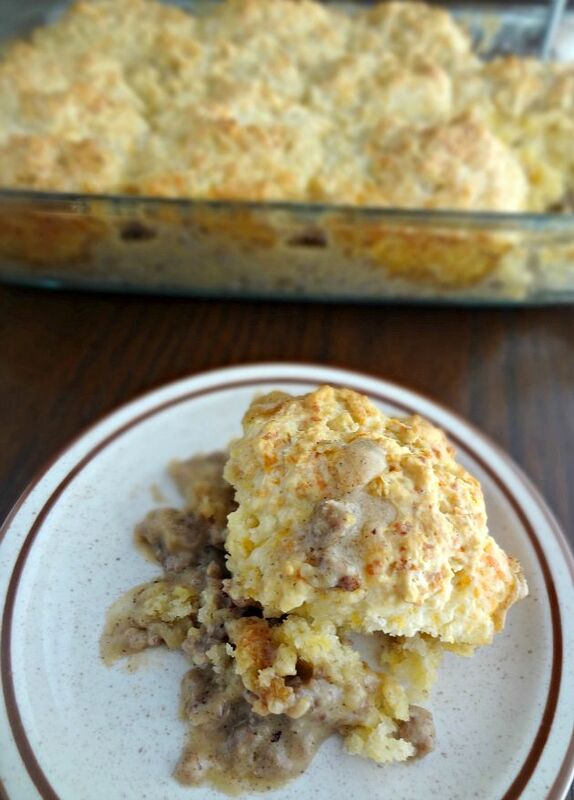 Drop approx 12 mounds of biscuit dough on top of the gravy. Bake 35-45 minutes, until the biscuits are golden brown. Serve warm! Store leftovers, covered, in the refrigerator for up to 5 days. I think I need to make this again like...right now.